FBI contractor Jake Cole deciphers the language of murderers by reconstructing three-dimensional crime scene models in his head, a talent that has left his nerves frayed and his psyche fragile. Jake returns to Montauk for the first time in a quarter of a century when his father, a renowned painter, lights himself ablaze and crashes through a plate-glass window. Once home, Jake is pulled into a gruesome local homicide investigation that echoes his mother’s murder three decades earlier. As he sifts through the detritus of his father’s madness, Jake discovers thousands of seemingly meaningless paintings stacked in the studio – a bizarre trail of dust-covered breadcrumbs the painter left as he tumbled down the rabbit hole of dementia — breadcrumbs that Jake believes lead to the killer. A stifling heat wave rolls into New York City, amplifying the already critical level of tension in the fragile concrete ecosystem. The air tastes of electricity and the negative charge of bad things to come - but everyone hopes it's just the heat. Then, on the morning homicide detective Alexandra Hemingway finds out she is pregnant, a twisted serial killer makes his debut. And the heat goes up. Not for the feint of heart, Harvest redefines the detective novel - order it now. After the sudden death of his wife, best-selling horror writer Gavin Corlie has a hard time keeping a grip on the world around him. Deciding that he needs a change, he purchases an old house nestled into a hillside overlooking a quiet lake in upstate New York. It is here, where things seem idyllic, that he hopes to finally begin the elusive process of healing. But Gavin soon learns that he has moved into an ecosystem that is vastly different than the one he left when a handicapped boy named Finn Horn nearly drowns on the lake. Out here people keep disappearing – and Finn insists that there is a monster out there. Is Sheriff Xavier Pope – a vodka and Benzedrine fueled menace who hunts children to placate the cockroach circus that lives inside his mind – responsible? 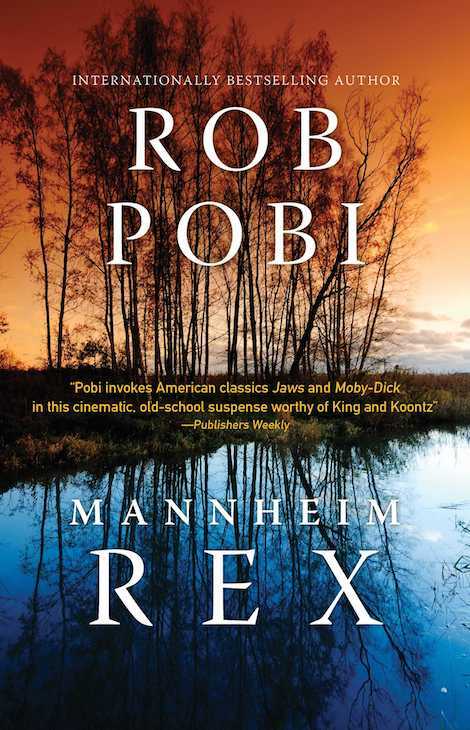 In Mannheim Rex, the characters are pitted against something much older, and much more menacing, than a bad cop with insects in his head; a nightmare that has appeared in legend since the 13th century, and evolved with a single purpose – to feed.